Yesterday we did some more things with complex arithmetic, taking a look at how some simple operations result in surprising things. For instance, take 1/j . Multiply both sides of this equation by j/j and you'll get j/j^2, or j/(-1), or -j. So 1/j = -j. Weird, if you're used to conventional real number arithmetic. Oh. What is j? It is the variable representing the square root of -1. You may know j better as i from your past math courses, but it changed its last name when it immigrated to EEland, since electrical engineers usually reserve i for the variable describing current. 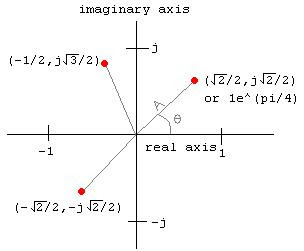 It's used in complex numbers, usually written with the variable z, in rectangular form (z = a + bj) or polar form (z = Ae^(j*theta). You can switch between the two by plotting them on a graph and using trig identities. This is a terrible explanatory graphic. All radii (radiuses?) are 1, and the angles are supposed to be pi/4 (45 degrees), 2*pi/3 (120 degrees) and -3*pi/4 (-135 degrees); I'll let you match them up. Scrap the lecture and just give us the worksheet. This would probably necessitate the creation of explanatory text around the formulas to deliver the content Diana did in her lecture, but we'd be working in groups at our own pace and free up the professors to wander around like they did in the latter half when we were just chugging on problems. This is how I was taught math in high school, and I absolutely loved it. Make the worksheet in LaTeX instead of Word. Not a big deal, but the typesetting you get from TeX is typically nicer than MS Equation Editor. It's one of those "it's made already so it's fine, but if I was making a new one..." little things. In other news, I can't do arithmetic any more, and I've forgotten the exponential identities for sine and cosine. I also spent most of the lecture before last (Wednesday) trying to derive the concept of Taylor series from scratch because I'm trying to remember where Euler's identity comes from; it's the same thing that the formulae Ae^(j*theta) = A*sin(theta) + j*A*cos(theta) comes from and we see that ad nauseum in SigSys. I refuse to look it up in the textbook. So far I've been able to derive MacLaurin series, which are Taylor series with a=0, starting from just definitions (...yeah, I went back all the way through calculus and the definition of the derivative; that's why it took the whole lecture). I can feel the rust flaking off my brain. I wish Blogger did equations. I may switch to Wordpress or something that has a mathML or LaTeX plugin because of it. For the record, I usually don't listen to lectures; they provide a pleasant background noise while I plug on random problems that catch my fancy. I ought to go to them more often, though; they're a good way for me to make sure I have time set aside for work, and being half-aware of them reassures me that I'm (probably) not missing anything, or that I can ask people about stuff in the lecture afterwards. I'm not sure whether I would have this severe of a visual learning style if I actually had a functioning auditory pathway, but as it stands it's easier for me to read things than to listen to lectures, which... is, as Eric VanWyk just walked through the lounge and pointed out, probably why I suggested the "scrap lectures and give us worksheets" method above. I do benefit disproportionately from it (mostly because I'm at such a disproportionate disadvantage already in lectures), but from past experience in high school I think it helps hearing people as well. I wonder if there's a way to make textbooks and worksheets better for auditory learners. Hmm.